Groupon has raised $700 million in its initial public offering and is currently trading much higher than the original $20 per share asking price. The daily deals company managed to sell 35 million shares at $20 each, thus becoming the largest tech IPO by a US Internet startup since Google. Groupon set their IPO at $20 per share late Thursday, up from the $16 to $18 range that most expected. A higher price signifies that investors are anxious to gather up shares quickly and as of now, it looks like those expectations have been met. According to The Economic Times, the price gives Groupon a market value of $12.7 billion which discredits analysts who predicted the company would only be valued between $5 billion and $10 billion. Stock in the Chicago-based company jumped to $31 shortly after their shares began trading today but they have since dipped back down to around $27 as of writing. 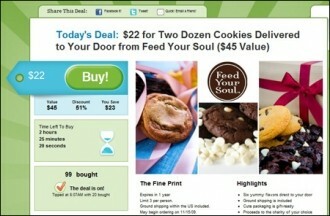 This is good news for Groupon, a company that has stumbled a bit on the way to their IPO. In August, Groupon was forced to amend their S-1 public offering filing to correct what was called unusual accounting practices. The Securities and Exchange Commission said the company had reported higher revenue than it should have. CNET said Groupon reported $713.4 million in revenue for 2010 but that number should have been $312.9 million, according to the SEC. In 2004, Google managed to raise $1.67 billion in their initial offering. Since then, the search giant has become one of the biggest companies in the country with a market value of nearly $200 billion.